Event Venue: 530 S. Clinton St. Built upon the elevated railroad track land running through the south end of historic Armory Square, the Rail Line offers multiple levels of parking. 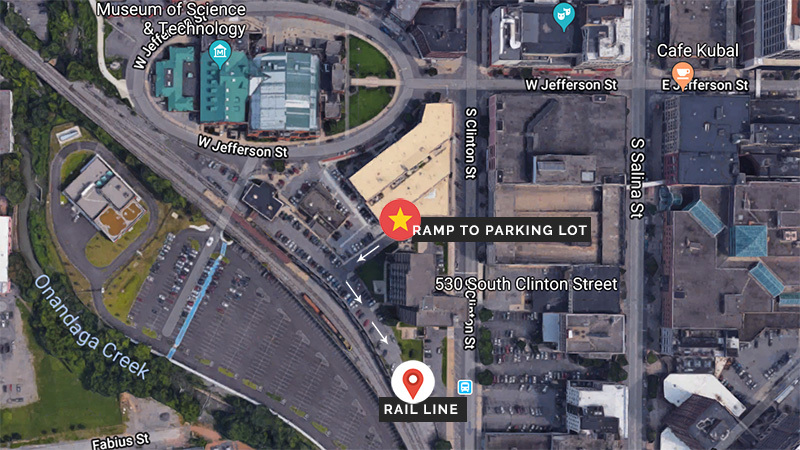 Off-street parking is available at the building level by entering the ramp on the north side of Clinton Plaza (the sign currently reads Parking for Jefferson Clinton and we'll be adding our own parking sign). During the day we have about 30 spaces and after employees and tenants leave our neighboring offices, we have 80+ spaces. At street level, there is always plenty of parking on S. Clinton Street. Armory Square offers plenty of parking garages and lots as well. The newly-located Redhouse Arts Center also has a parking garage across the street on S. Clinton, just past W. Jefferson St.